One of the most striking written versions I came across in my research is the one commissioned by Rana Jagat Singh of Mewar, which has survived since the 17th century. An illustrated manuscript in seven books, Jagat Singh’s Ramayana was commissioned in 1649 and has been separated for over 150 years: five of the books have been in the British Library since 1844 and the other two books have been in Mumbai and Udaipur. Now the British Library has digitised their holdings and all that remains of the work is to be reunited online. The Jagat Singh Ramayana is not only packed full of remarkable paintings – images that help us visualise an ancient imagination from the viewpoint of 17th-century Indians – it is also dazzlingly multicultural. Commissioned by a Sikh, this Sanskrit text owes a debt to a Hindu storyteller, and was illustrated by a Muslim. Most of the manuscript has also spent a large part of its life in the west. The internet is the rightful home for such a great text. 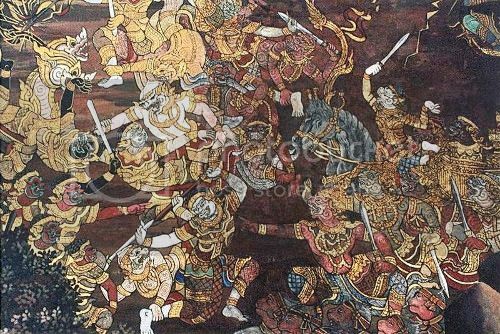 The Ramayana is one of the greatest stories ever written, visualised or heard. As such it should be available to the world. For starters it is the most controversial of subjects in Hindu Iconography and being very much the amateur i am treading a precarious line here, but then what is so special about this form that has seen its spread across the nook and corner of not only India but deep into South East Asia – in central Vietnam, into Cambodia – and that too as early as the 6th and 7th Centuries ? Cannot believe it… Standing a full 4 feet tall, holding the pride of place among exhibits, the massive stone pillar is an awe inspiring site. On closer scrutiny, it is not any stone pillar but a Shiva linga and this is no Indian Museum – this is at the Museum of Vietnamese History, Hochi Minh city, Vietnam and is a local find. Fu Nan period, 6th C CE. After bringing us the tale of Joao Da Cruz, Maddy has the fascinating story of Koya Pakki, who played a major role in the relation between Cochin, Calicut and the Portuguese. So we see that the shaming of Cabral and the murder of Aires Correa by the Arabs of Calicut had disastrous effects, and resulted in Vasco da Gama coming again- we studied the massacre of the Meri. Koya Pakki as we saw, survived the attack at Calicut in 1500, moved farther to Cannanore and came back as a friend of Portugal, sometimes also as an emissary of the Zamorin as is stated in some books. In fact it is also likely that he may have just carried a commission of the Zamorin to Lisbon in 1515, though not travelling as a formal emissary of the Zamorin, if I read the story right. It is also clear that it was Koya Pakki who assisted the Portuguese in moving their sights to Cochin and Cannanore, thus isolating Calicut from later Portuguese trade. Finally we saw his involvement in the last scene of the play, supporting the Portuguese flight from the Calicut fort and earning punishment from the Zamorin. So that was Pakki, yet again a small fry in the big story, but the person who was key to many an act. It is possible, however, that the British Library maps were based on an earlier model since their details complement rather than duplicate the printed account. They include references to the residence of Maharaja Amar Singh who ruled Patiala from 1748 to 1782, and “the late Burhan al-Mulk”, the first Nawab of Oudh, who died in 1739, besides frequent mention of ruined serais (‘travel-lodges’) which were probably destroyed in the disturbances from the mid to late 18th century. Unlike the memoir, both maps extend the route as far as Kandahar. The Virtual Victorian has a post about two members of Indian royalty who went to England, got converted and whom Queen Victoria tried to engage in matrimony. With both of the young Indians having converted to Christianity, and with any offspring they might then produce most likely to be Christians themselves, Victoria saw it as her mission to join the pair in matrimony – hoping that this might be the start of the spreading of the Christian faith throughout the whole of the India. However, there is a saying that man may plan but God unplans, and even the plans of a Queen may fail when it comes to matters of matchmaking. Whether or not Gowramma was attracted to Duleep (she was known to be an atrocious flirt, even making eyes at the Prince of Wales, and then discovered in an affair with one of her guardian’s stable boys) the handsome young prince was not convinced to wed his fellow Indian. The e-mail should have “Carnival” in the subject line, else it will escape my filter. Please send your nominations by e-mail to varnam.blog @gmail. The next carnival will be up on April 15th.